PROTIP: You can take a look at the readings here. This homily focuses on the theme of the Eucharist. So a few years ago, I had the opportunity to travel to Italy with my family. We spent two weeks traveling up and down the peninsula, soaking in the sights, sounds and local cuisine. And it was during this trip that I learned a really important lesson about myself. I don’t like to share. See, my family and I would all sit down for a meal and inevitably the questions would start. ​Would you like to try a bite of this? ​Can I soak up some of your sauce with this bread? ​Oooo can I snag a piece of your fish? ​You have to taste this pasta, it is delicious. And my answer was always the same. Nope. See it seemed pretty straightforward to me. If you wanted my meal, just order it. If I wanted your meal, I would have picked it. Why must we share? I know, I know. You would think that priests would know better. But it seems that desire to have things under one’s control. To have clear distinctions and boundaries. To know what is mine and what is yours. It seems that these desires run pretty deep. For sharing is so messy. Food gets dropped. Germs get shared. And you never end up dividing things evenly. And yet, at my core. I know that I’m wrong. Yup, I know. Stop the presses. I am admitting I am wrong and my parents are right. It’s like a Father’s Day miracle. But it is true. For sharing is part of what makes family what it is. Yup, it is messy. But it is also incredibly life-giving. Sharing the ice cream cones that drip all over one’s shorts and the bites of wedding cake that crumble onto rented tuxes and bridal gowns. Sharing the booboos that need a kiss to make them better and the snuggles from a child covered in mud from his adventures in the rain. Sharing the joys of hellos and tearful goodbyes. Sharing the quiet moments on the porch during the evening twilight and the late-night phone calls when we’re apart. Sharing in the funerals and weddings, the births and the illnesses, the failures and the success, the bitter and the sweet. And ultimately, this is what it means to be a part of this wonderful, chaotic family that we call the Church. For on today’s feast, we are reminded of the truth of what we do when we gather around this table. We are reminded of the truth of what it means to share. See in some ways our Eucharistic celebrations have become too sanitized. 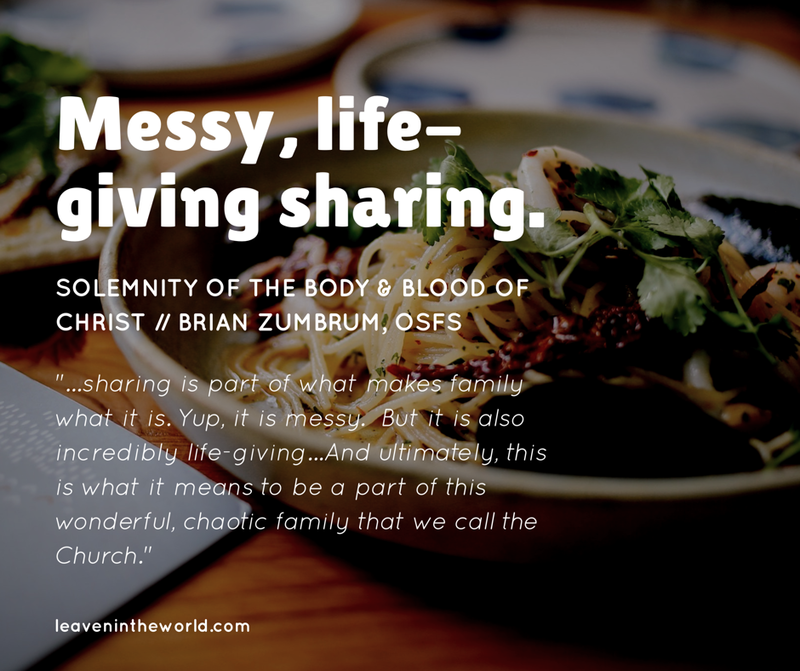 And it has resulted in too many of us thinking that we no longer have to share when we come to mass. For we can get our individual host reserved just for me. We can walk right by the cup without much concern for what we’re missing. ​We can sit in our comfortable pew where we don’t need to interact with anyone else. ​We can have our Jesus time without distraction from those other people. But this is the complete antithesis of the message we hear proclaimed this morning. For in the readings we are reminded that we share in one loaf, one cup. ​And this sharing should be messy. For when you tear a loaf of bread, it never tears evenly. Crumbs will be scattered. And someone else’s fingers are all over it. When you drink from one cup, you risk spilling as the cup is shakily passed from one hand to another. Germs may be spread and there are times when there does not seem to be enough to go around. ​For it is a reminder of the true sharing that we do when we share this Eucharist. ​We share in the messiness of each other’s lives. And just like Christ experienced from the listeners during his time, this messiness will be resisted. ​Must we share in the struggle of the addict or the love of a gay couple, the ​plight of the immigrant or the PTSD of the veteran? Must we share in apathy or the frustration of our family members who no longer come to Church? ​Must we share in the politics of our parents or our children? Must we share in the anger of the one we’ve hurt or the pain of the one whose grieving? Must we share in the cry of the oppressed? Must I share my own shortcomings and failures? Must I share my own vulnerabilities and idiosyncrasies? Yes. Yes. We must. For unless we share of his flesh and drink of his blood, we shall not have life within us. So let us dare to say our yes, our Amen, my friends. Amen to one another. Amen to those sitting beside us and those who have gone before us. Amen to those who we do not know, we do not like or we do not understand. Amen to the mess and the beauty. Amen to the life and the love that surges within us. Amen to the brokenness and darkness that is a part of us. Amen to Christ. The Christ present in the word proclaimed, the body broken, the people gathered. Amen to the Christ within us.